Questions are being asked as to the design and construction of the recently added wooden hoarding attached to the masonry wall and the possibility that it may have acted as a lever increasing the wind loading and pulling the wall to collapse. The City of Melbourne is responsible for issuing permits for the design and construction of building site hoardings. It is unclear if a permit was issued for the new hoarding or if and when the site was inspected prior to its collapse. A CCTV camera located on the adjoining RMIT building and pointed along the Swanston Street footpath may hold the key and vision of the walls collapse. Redevelopment plans for the former Swanston Street CUB site have been on the drawing board for decades with numerous designs and owners. 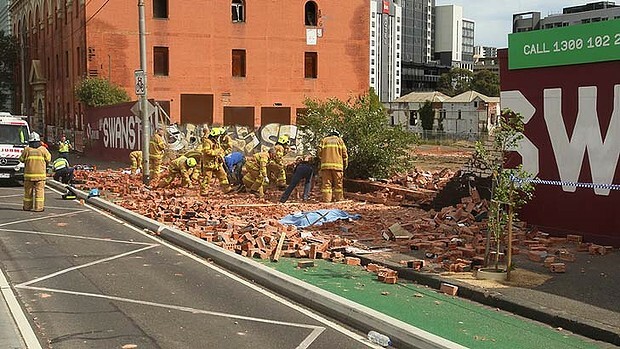 The wall that collapsed was retained at the bequest of the City of Melbourne Urban Design department headed by architect, Professor Rob Adams. Building company Grocon payed $1 million for the six-week dig, which ended on March 1. 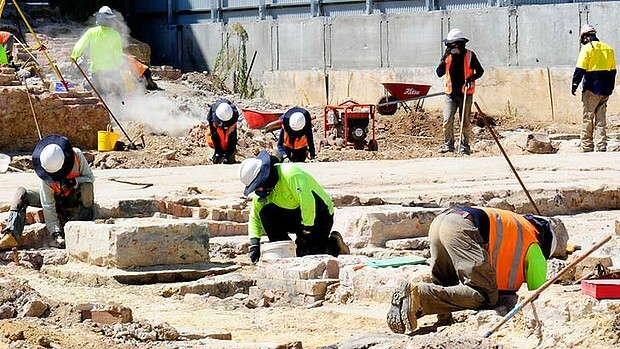 The dig was a Heritage Victoria requirement before Grocon redevelops the land. Sadly the wall which collapsed on Thursday had been standing in a dilapidated state and was scheduled for demolition as part of the new approved design. The collapse of the wall at the old CUB Swanston Street site was avoidable yet it was an accident just waiting to happen. The wall had remained in situate for over 20 years deteriorating as each year passed. The City Council Engineering and Urban Design Departments knew that the wall was not stable and they failed to monitor it and ensure its safety. The Swanston Street site was a significant site in Melbourne the book end of Melbourne’s main street. The shrine at one end and the CUB sign at the other. It was one on five constructions sites that were left standing in a demolished state by the former Minister for Planning, Robert Maclellan . The main heritage building was the 1860’s bluestone building on Bouverie Street. Most of the original bluestone building was demolished but the western wall was maintained, supported by solid structural bracing. Of a lesser heritage value was the red brick wall along Swanston Street. With over twenty years of exposure to the elements the structural integrity of the wall was compromised. The Swanston Street wall had not been braced to the extent of other walls on the construction site. The CUB site was one of the alternative sites put forward for the site of Melbourne’s Museum and the favorite site of Trevor Huggard, former Lord Mayor. It was a site that required a signature development and the Museum, if located on the site, would have made a significant contribution and focus to what is the gateway to Melbourne’s “Knowledge precinct”. It was one of three preferred sites for Melbourne’s Museum. The others being the Federation Square and the original site where the Melbourne Exhibition Buildings (Jeff’s Shed) now stands. The Swanston Street Wall became a poster board and a blight on the City. A monument to the city’s failure in planning and development. The City of Melbourne, who had insisted in the walls retention , required that the wall be boarded up and the graffiti and posters removed. Sadly this may have contributed to the walls collapse. The wooden hoarding would have added to the dead load placed on the structure and when part of the wall began to collapse it would have brought down the rest of the wall with it. The hoarding also hid the wall from the Street and restricted the ability to monitor the walls structural integrity. It may have even been the cause for the collapse as the poorly supported left hand section of the hoarding may have caught the wind and acted as a lever in pulling the masonry wall over. This was not an accident that can be dismissed as being an act of god.. The winds, whilst high, were not that extreme and the wall should have been able to withstand a live wind load much greater than the force of wind recorded in the city on Thursday. It is clear there was a collective failure of responsibility to ensure the public safety of this site. The developer, the construction engineer, site manager, building inspectors (past and present) all share liability along with State Government and the City of Melbourne Engineering and Urban Design Departments. This was an accident that should not have happened. An accident that should have been avoided. The lives of two innocent pedestrians lost and a third person suffering serious injury. 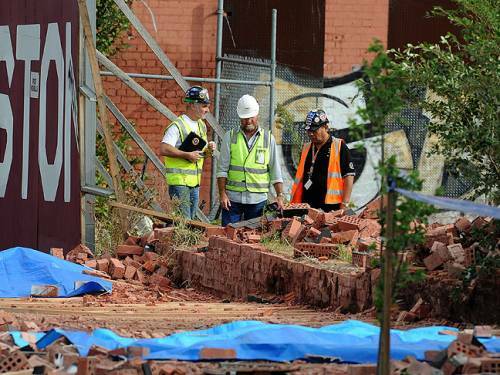 The Coroner will need to investigate the deaths of the two pedestrians and work safety will prepare a report of the engineering and structural design elements that contributed to the walls collapse. The Coroner must go beyond the engineering science and look closely at the administration and successive failures of the City of Melbourne and other authorities who should have been on top of this issue long before the walls collapse. It must look at administration, planning, reports and events in the lead-up to the sites demolition and up to when the wall collapsed. 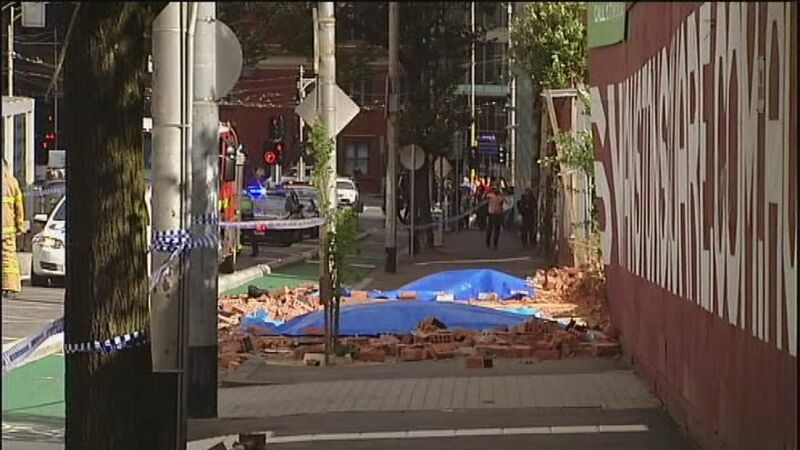 Tragedy hit Melbourne just before 3pm on Thursday March 28 when a brick wall on a construction site in Swanston Street collapsed, killing two students and seriously injured a third pedestrian who happened to be in the wrong place at the wrong time. Not since the collapse of the West Gate Bridge has Melbourne seen such an event, an event that is reminiscent of an war zone, earth quake, tsunami, flood or a terrorist bomb blast overseas. 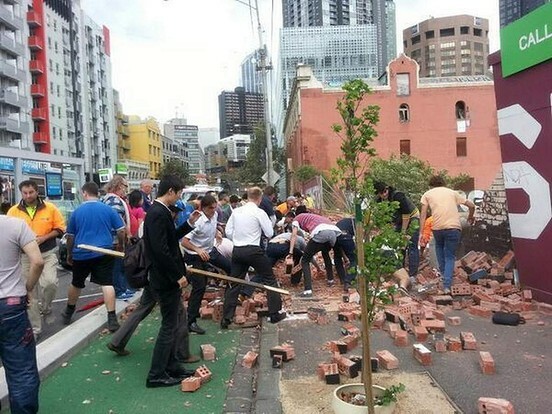 The wall collapsed when a gust of wind in Melbourne hit and blew it over, killing the unsuspected pedestrians. Clearly the wall was not supported or engineered to withstand the lateral forces that eventually brought it collapsing down. The building site was left in an unsafe condition for years whilst developers and city planners toiled over what to do with the site. There was insufficent bracing or reinforcement to secure the wall in a stable position. Excavations, heavy rain and weather conditions all played a roll in the wall’s collapse. Questions are being ask who was responsible for the accident, Developers, City Planners, Work Safe Building Safety Inspectors, City Council Engineering Services? The accident will be the focus of a Corner’s Court and work Safety investigation. It must not be just listed as a freak accident due to extreme weather conditions. Clearly there was negligence in administration. This must not be allowed to happen again. Safety guidelines, development plans and inspection procedures must be reviewed and changes made to enforce public safety standards. The City of Melbourne is required under the Local Government Act to review its list of delegations within 12 months following the Municipal election. There is ongoing concern at the misuse and abuse of decisions made under delegation. Whilst there is a requirement for a register of delegations there is no mandatory requirement to maintain or publish a register of decisions made under the instrument of delegations. This leaves the whole system of governance wide open to misuse and abuse. No one knows who and when a decision is made and under what authority the decision had. Individual Councillors under the terms of the Local Government Act and the Councillors “Code of Conduct” can not direct Council Staff in the performance of their duty or in exercising any decisions made under delegation. It is unclear if that applies to decisions made by the Council as a whole. (Section 76E (3) of LG Act) By inference a Council can direct the CEO to take certain action within some limits. The power of delegation is limited to expressed delegations made to the Chief Executive Officer, a member of staff and or special committee or advisory board. A person or bodies who have been delegated authority can not further delegate to someone else or another body powers or duties delegated to them. If this is required this would have to be done by way of amending the substantive authority of delegation. It sounds a bit convoluted but it is designed to ensure that there is a clear line of responsibility and authority. Untangling the web of delegations is an art form unto itself. Understanding the process is made that much more difficult when decisions are made under delegation and there is no central database or record of those decisions. We have raised the issue of delegation and the need for a register of decisions made under delegation with the Lord Mayor and Councillor Stephen Mayne, who is chairman of the Council’s Governance Portfolio. We hope this issue will be looked into and addressed when the new Council finally gets around to reviewing the register of delegations. From our past experience this will be one of those last minute decisions that the Council administration will present to the Council at the last minute giving them little time to seriously pick though the list of delegations and understand exactly what powers they are delegating. A register of decisions made under delegations, if properly designed and implemented, would give Councillors a better understanding and oversight of the delegated process. Do not hold your breath. Previous Councils have not got around to reviewing the process properly and we do not expect, although we remain hopeful, that this council will get it right either. Maybe Stephen Mayne will be the one. Somehow I think not. It should be noted that there have been a number of assemblies of Councillors that have taken place this term that have not been listed on the City Council’s published register But we are noting them and recording the details along with keeping a close eye on Councillor expenses, interstate and overseas travel. The City of Melbourne rightly rejected the motion of resentment put forward by Cr Richard Foster at last Tuesday’s Council Meeting. The issue under discussion was the need for community action to prevent criminal behavior associated with some persons who are “begging” on Melbourne Streets with concern that vulnerable citizens and visitors to the City were subjected to harassment, threats and intimidation. Fosters motion, like this proposed citywide smoking ban, was ill-considered. Clearly he had not thought this through. Foster realizing that his motion was facing serious opposition tried to modify the motion but in doing so only highlighted his own failings. Cr Foster may also be in breach of the Council’s Code of Conduct Item 3.2 which is a serious offense. As a Lawyer Cr Foster, although not a signature to the code, should have been aware of this. In a surprising but correct move Cr’s Leppert and Oake opposed the motion. Melbourne City Councillor. Richard Foster, is seeking to gag and prevent the City of Melbourne facilitating meetings or conducting discussions with Victoria Police and Welfare Organisations and other stakeholders from canvassing issues about begging on Melbourne’s Streets unless they have consulted and received his blessing. The motion put forward by Forster is in response to the leadership role taken by the Lord Mayor Robert Doyle earlier this month to address ongoing concern about aggressive begging on Melbourne’s Streets. As anyone who has spent time on Melbourne’s Streets can attest there are a group of individuals who aggressively harass and intimidate people into handing over money cigarets. Their tactics go beyond just asking for money to assist in their living costs. The targets of these aggressive “beggars” are the vulnerable, our elderly and foreign visitors. They approach their victims and demand cash or commodities such as cigarets. If the person refuses they then stoop to acts of intimidation, threats and assaults which boarder on criminality. In some cases they are supported by others who corner and gang up on their victims . You only need to look at the CTV footage to catch these petty criminals in action. If this is not addressed soon someone will be seriously hurt as things get out of hand. The Lord Mayor, Robert Doyle, is rightly concerned about this behaviour has sought the support of the Victoria Police and Welfare oganisations such as the Salvation Army in trying to address this issue. 1.3. Request the Chair of the People City Portfolio to report the outcomes of these discussions to the Future Melbourne Committee (FMC) at the earliest opportunity in order that any further action may be determined by the (FMC). If the motion is passed the City of Melbourne would cease all work and liaison with the Police and welfare organizations until Richard Foster has had the opportunity to consider the proposals and give his consent. Richard Foster needs to put his ego aside and act more responsibly. It is not an urgent motion and if Council is sincere about its desire to maintain open and transparent governance, it should refer this motion for proper consideration to the Future Melbourne Committee. CLOSING a traffic lane over Princes Bridge to make more room for cyclists is as silly as the antics of the “birdmen” who ride off the bridge each year at Moomba. Car chaos will be the result of the plan by Melbourne City Council to make the city more bike-friendly. Forcing traffic into a funnel over the bridge is likely to cause gridlock at the intersection of St Kilda Rd and Flinders St under the station clocks. This became congested when the city council decided to block Swanston St to traffic and would become impassable during peak periods. Clashes between drivers and cyclists promise to become even more heated. RACV manager of public policy, Brian Negus, describes it as a “cheap option” and an “unacceptable proposal” in what is an already busy area. This proposal will make it worse. Cars and cyclists are not a happy mix and while cars can be a lethal weapon when drivers are impatient and frustrated in traffic, cyclists are often to blame by shouting abuse at drivers and banging on car doors. All road users are entitled to travel in safety, but Melbourne City Council needs to rethink what is a dangerous waste of money. The RACV has blasted the idea, saying it would increase commuter congestion and pose safety problems on the bridge and at the “complex” T-intersection of Swanston and Flinders streets. The council’s Bicycle Plan 2012-16 proposes installing “chevron-separated lanes by removing one lane of traffic”. “This will increase the capacity of a major link to the central city, improve safety and reduce pedestrian/cyclist conflict,” the plan says. VicRoads and City of Melbourne are using traffic modelling as part of planning. Cr Cathy Oke, who chairs the City of Melbourne’s transport committee, declined to comment before the design was signed off. RACV general manager of public policy Brian Negus said removing at least one lane of traffic appeared to be a cheap option. “They should either be looking at changing the cross-section on the footpath or indeed looking at another separate bridge for bicycles,” Mr Negus said. “Our interpretation of what is briefly outlined in the document is one lane of traffic disappears in both directions. Mr Negus called on the council to undertake a feasibility study for a new pedestrian and cyclist bridge next to Princes Bridge. Council spokeswoman Irene Vlahos said the proposed works on Princes Bridge were part of $5.6 million allocated in the 2012-13 budget to improve the city’s cycling network. Twenty-two cyclists were injured after smashes on Princes Bridge between 2008 and 2010, according to VicRoads statistics. Bicycle Network Victoria counted 1864 bikes on the bridge between 7am and 9am during its annual counting day earlier this month. Mr Negus said the RACV also opposed council building a $2.4 million separated bike route on La Trobe St. The City Council continues to lock down the city causing ongoing congestion in the city centre. The Council has come under fire for its Bike Madness and lack of community consultation. Motorcycle riders in particular have not been consulted. The City Council’s Engineers are slowly strangling the city. Swanston Walk was originally planned as a pedestrian street but has has now been overtaken by Lycra clad cyclists who show little concern for other road users or pedestrian safety. Add to that the closing down of traffic lanes in La-Trobe Streets and other ill-considered bike plans. Businesses are crying out and not being heard. The cost of doing business in the CBD retail precinct is diving retail business out of the city with the cost of couriers and delivery set to go through the roof as movement around the City Center is further constricted. Robert Doyle appears to be held hostage to the Greens and overzealous Engineers. This could be the issue that brings down the Lord Mayor and team Doyle if they do not begin to address it properly. The Council reports gave the impression that the Council’s 5.4Million nike plan was approved by the RACV. This clearly is not the case. Stakeholder representative groups have been ignored and their opinion shoved aside. The extent of the Council’s consultation process was a few meetings with Bicycle users groups held in city cafes over a cup of coffee. The City Council needs to stop and rethink its plans and hold a major forum and review of its Bicycle network or face the wrath of business and motorists alike. There are conspiracy theorists out there that claim Simon Crean sacrificed himself to put and end to Kevin Rudd’s challenge rumors. Kevin Rudd has been constantly undermining and destabilising the Labor Government ever since he lost the leadership. The white-noise and background static was drowning out what is an impressive message and record of good governance. The economy is growing, we have relatively low unemployment and the government has embarked in a impressive and progressive agenda of social reform. Clearly Kevin Rudd has not acted honourably. Rudd should have taken in the lead from Ted Baillieu who, having lost the support of his caucus. resigned and moved silently to the back bench. Rudd was extended an olive branch and allowed to retain the portfolio of Foreign Affairs. Something that was generous to say the least. Kevin Rudd and his ego was his own undoing. He placed his personal interests above the interests of the Party and that of the country. Much of the white noise came from a lazy media that could not take the time to report on policies and issues of substance. Instead they became embroil in the media frenzy feeding of false leadership challenges. Even when there was a snow flakes chance in hell of Gillard being ousted. If any journalist again reports or speaks of a leadership challenge without naming names you can bet for sure that this another example of unprofessional and untrustworthy reporting. Simon Crean in calling on the challenge said he did so to provide a circuit breaker. It might not be the circuit breaker he had first sought but hopefully it has and will provide the necessary break and clean air that is essential if Australia is to duly assess the choices we will have to make in September. The choice is clear Tony Abbott or Julia Gillard. Gillard in my view has, by far, more integrity then Abbott. Greens Melbourne City Councillor, Rohan Leppert, plays cheap divisive politics and in the process brings the City Council into disrepute. Analysis of the 2012 City of Melbourne votes, using a full proportional voting system where the cake is divided into nine slices, indicates that Rohan Leppert would not have been elected, in his place community candidate Kevin Chamberlin should have been elected. A pure proportional system would not have discarded or disenfranchised Team Doyle’s 8% surplus, each vote would have equal weight. Rohan Leppert is calling on the City Council to refer the conduct of the Victorian police to the newly created IBAC anti-corruption body. Rohan Leppert is a clear indication the style of politics advocated by the Greens. There are much more pressing issues such as the need to restore open and transparent governance in the City Council, issues related to traffic management, infrastructure, planning ,finance and electoral reform that need addressing that Rohan Leppert has not addressed. Whilst Rohan Leppert seeks to claim the mantle of civil libertarian the fact is he is naive and undemocratic. The Greens themselves are renowned for the lack of transparency in there party policy development with Journalists denied access to their state conference forums. Rophan Leppert himself has also been critic for banning those critical of Green policies from following him on Twitter. A case of do as he says not what he does. Rohan Leppert, having been elected to the City Council must also consider his fiduciary duty to the Council as a whole and the Councils local laws not sectional political grandstanding. This issue would also be a test of integrity for other City Councillors including Jackie Watts, Richard Foster and Stephen Mayne. Melbourne City Council last night demonstrated the Councils inability to provide good governance and proper planning. The Council’s pride was wounded as the City of Melbourne faced reality that its planning scheme does not meet the demands of a growing and innovative city or facilitate good design. There was acceptance that the proposed Australia 108 project was a quality development that would contribute to Melbourne built environment. does not comply with the City’s Planning Scheme provision and its established high limit of 100m. The Council has been sidelined in the planning process. So impressed with the proposed design Deputy Chair of Planning, Cr Stephen Mayne, called on the State Government to make it a condition of the development that Nonda Katsalidis be retained as the projects Architect. The City of Melbourne employes a fleet of staff and consultants all who are highly paid. Previously Cr Mayne had complained that the Council was only given 14 days to respond to the proposed development, however the council was able to consider and respond to the Minister within a week of being asked to respond to the Ministers invitation. The problem is not the project design but with the Melbourne Planning Scheme. The City Council planning system and its involvement in major projects has been in free fall ever since the City back-downed and supported the shift of the Melbourne Museum from the centre of the city to the outskirts. Whilst the Council remains an advocate in the planning process, it’s credibility and relevance is non exsistant. Until they become proactive and embrace good design and innovation all the winging and crying in the beer will not help. Melbourne City Councillor and serial candidate Stephen Mayne’s bid to win the Municipal Association of Victoria’s presidency came a cropper with Stephen Mayne only managing to secure 14 votes. Mayne came in third with incumbent president Bill McArthur re-elected with 44 primary votes behind Andrew Munroe who had 16 votes. Costing the City of Melbourne over 38 Thousand dollars in the first year and a further $55,000 every year following. Stephen Mayne tried to dismiss his defeat by claiming that “his push to the presidency was was never about winning“. Having been derailed in his obvious push to power and trying desperately to not be seen as irrelevant, Stephen Mayne claim a victory for the gender balance with the MAV electing a majority of women on the MAV board. Previously women represented 5 out of 13 seats on the board and now can boast a majority having secured 7 seats held by women and 5 by men. The support shown for women delegates was not reflected in Stephen Mayne’s push for the presidency.